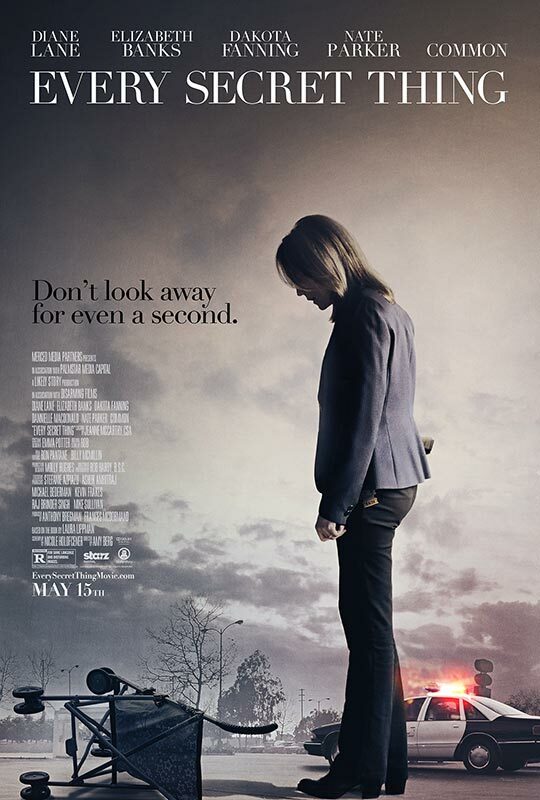 Celebrated documentary filmmaker Amy Berg directs the crime thriller Every Secret Thing. The film focuses on the recurring crime of kidnapped children within a given area. It all starts out well enough with a look into similar events that happened years ago building up a sense of intrigue that quickly fizzles out in the convoluted plot. Basically years ago two young girls kidnapped an infant and mistreated her to the point where she died. In the present day a similar situation has arisen and these girls are suspects again. The teenage Alice (Danielle MacDonald) and Ronnie (Dakota Fanning) are initially interesting with special attention to be paid to Alice who seems innocent enough but there’s something not quite right about her. Lots of time is spent on establishing Alice as she seems to sleepwalk her way though life completely ignorant to the fact that she was completely at fault all those years ago. Her insistence that she was put way for a crime she didn’t commit raises plenty of alarm bells as flashbacks flesh out this part of the story. Much of the narrative follows the investigation led by Nancy Porter (Elizabeth Banks) who has her suspicions about Alice right from the start. Unfortunately the film makes this point over and over again instead of exploring more interesting territory. The whole story feels slow and the constant repetition gets really tedious after a while. I never felt that enough time was being spent building up the sense of intrigue that was so well established at the beginning. I think I was most surprised by the fact that abducted children wasn’t allowed to have the emotional heft that it should. There were some emotional reactions from the parents affected and Nancy is obsessed with finding the answers but beyond that there’s no reason to be emotionally connected to any of it. Everyone feels like they are going through the motions for the most part. By the end the resolution feels completely rushed and really doesn’t make a lot of sense as it relies on new information being dumped on the audience when it’s all wrapping up. I won’t spoil the answer but it’s completely predictable from the beginning. If some effort had been made to misdirect the viewer then it might have been a lot stronger. It definitely feels like this film drags on and on with nothing interesting to hold the attention. The cast are all good at what they do but beyond Danielle MacDonald they are given very little to work with. Elizabeth Banks simply has to trot out the investigation dialogue and Diane Lane has some of the most unconvincing lines I’ve heard spoken in a long while. It’s a shame that this turns out to be so underwhelming as it gets off to a strong start and it feels like there’s a better film underneath there. A more focused narrative and better overall characterisation would have made this a more engaging viewing. Unless you absolutely have to see every single crime filler out there then I can’t recommend this one as it’s a fairly poor example of what it’s supposed to be. This review is a short one as I can’t really discuss it at length without significant spoilers. There’s just not a lot here to talk about either. A strong opening and some impressive actor performances aren’t enough to salvage this poorly developed crime thriller. The severity of the case involving kidnapped children is treated as something of an afterthought with some lip service paid to the fact that parents miss their kids and the detective Nancy can’t rest until she brings whoever did this to justice. Most of the film feels like the characters are going through the motions. Similarly the case was developed really poorly with the constant repetition of information really making the whole narrative drag. There are no surprises in the resolution either as it is all set up as being completely predictable. The strongest member of the cast is Danielle MacDonald as her character Alice is given most of the dramatic stuff to work with. Elizabeth Banks’ Nancy is almost bereft of personality and Diane Lane has some really terrible dialogue to work with. I can’t really recommend this one as it starts off really well but gets progressively worse as it progresses. There are better crime dramas out there to be enjoyed so pick any of them instead.